Objective: Despite its high prevalence, the basic pathophysiologic mechanism of migraine is still poorly understood. Our aim was to research endothelial dysfunction in patients with recently diagnosed episodic migraine, and to determine whether there was a correlation between endothelial dysfunction and white matter lesions (WMLs) on magnetic resonance imaging (MRI). Materials and Methods: This study was conducted between 2013 and 2014. A total of 51 patients and 27 healthy controls were included in the study. MRI was performed in the patient group. Blood samples were collected to investigate serum level of lipids, thyroid hormones, asymmetric dimethyl arginine, and endothelin levels in the patient and control groups. Homeostasis model assessment = insulin resistance factor and brachial artery index flow-mediated dilatation (FMD) were investigated in both groups. Results: WMLs on MRI were present in 40 patients with migraine. 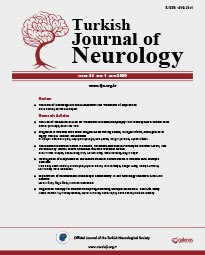 FMD was low in patients with migraine (p=0.021). There was a negative correlation between the severity of migraine headache and FMD. A positive correlation was seen between severity of headache and WMLs (p=0.001). The other blood sample concentrations in both the case and control groups were not significantly different. When the blood parameters were evaluated with MRI lesion load, there was a positive correlation with age, cholesterol, low-density lipoprotein, body mass index and triglyceride, and contrary to expectations, there was no relationship with homocysteine. However, there was a significant correlation between insulin resistance and lesion load (p<0.03). Conclusion: In this study, especially in patients with episodic migraine with WMLs, FMD as a marker for endothelial dysfunction was found to be statistically significant. This finding contributes to the pathogenesis of migraine. An endothelial therapeutic drug could be considered as an option, especially in patients who need prophylaxis.